Due to high global energy demands, there is a great need for development of technologies for exploiting and storing solar energy. 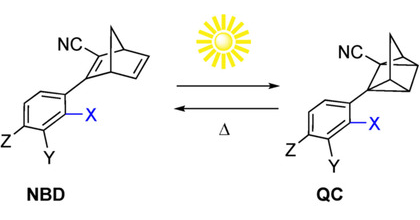 Closed cycle systems for storage of solar energy have been suggested, based on absorption of photons in photoresponsive molecules, followed by on-demand release of thermal energy. These materials are called solar thermal fuels (STFs) or molecular solar thermal (MOST) energy storage systems. 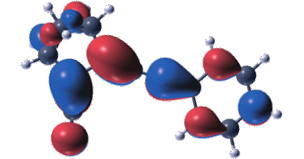 To achieve high energy densities, ideal MOST systems are required either in solid or liquid forms. In the case of the latter, neat high performing liquid materials have not been demonstrated to date. 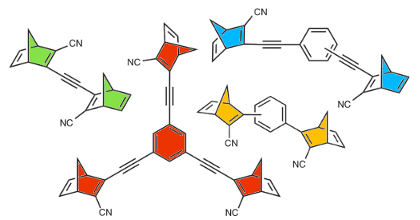 Here is presented a set of neat liquid norbornadiene derivatives for MOST applications and their characterization in toluene solutions and neat samples. Their synthesis is in most cases based on solvent-free Diels-Alder reactions, which easily and efficiently afford a range of compounds. The shear viscosity of the obtained molecules is close to that of colza oil, and they can absorb up to 10% of the solar spectrum with a measured energy storage density of up to 577 kJ/kg corresponding to 152 kJ/mol (calculated 100 kJ/mol). 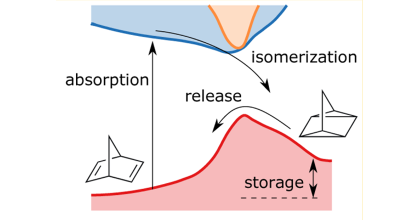 These findings pave the way towards implementation of liquid norbornadienes in closed cycle energy storage technologies. 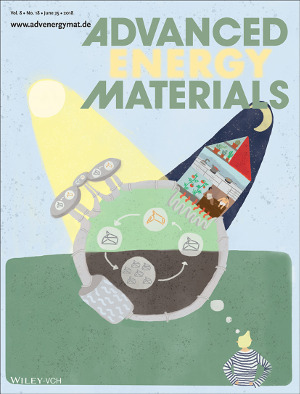 This paper was featured on the Cover of Advanced Energy Materials.